In 600 AD, the ancient Anasazi, or Pueblo Indians, lived and worked in Southwest Colorado. When resources became scarce and their crops had been compromised by drought and frost, the Anasazi left the region to settle in other parts of Colorado, Arizona, and New Mexico. The Spanish followed about 500 years later, striking gold. Miners established towns, leading to the birth of the railroad in the area. Today, this area is full of ancient ruins, deserted mining towns, national parks, and some of the best scenery in America. 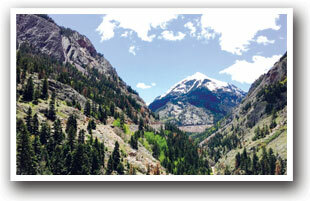 The San Juan Skyway Scenic Byway covers 236 miles of terrain across southwestern Colorado. This loop travels through Durango, Mancos, Dolores, Stoner, Rico, Telluride, Ridgway, Ouray, and Silverton. Be sure to allow at least two days to see everything this byway has to offer. The byway passes through five million acres of both the San Juan and Uncompahgre National Forests. Traveling the length of the byway will take you through high mountain passes and historical towns and by waterfalls and acres of wildflowers. In autumn, the aspen trees turn brilliant colors. Sunset Magazine recognized the area's superior beauty by writing, "The San Juan Skyway... possibly America's greatest fall-color drive...its aspen views are alternately breathtaking and intimate." There are many fascinating historical features in the area. Once a landmark for missionaries, conquistadors, and prospectors settling in the region, Chimney Rock is a designated Archaeological Area and National Historical Site. Many State and National Parks also populate the route of the byway. Both the Mancos State Park and Ridgway State Park are home to many recreational activities. Mesa Verde National Park is the home of the cliff dwellings of the ancient people and recognized as one of the most preserved archeological sites. 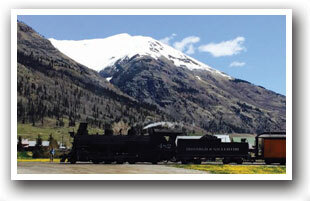 Also, the Durango and Silverton Narrow Gauge Railroad still operates carrying 200,000 passengers a year. Recreational activities include four wheeling, hiking, bicycling, hunting, photography, fishing, kayaking, dirt biking, and motorcycle tours. 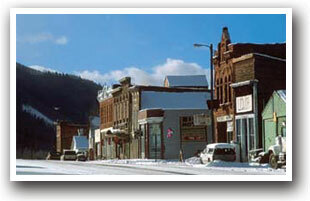 For a more relaxing stay, visit town shops and hot springs in the area. 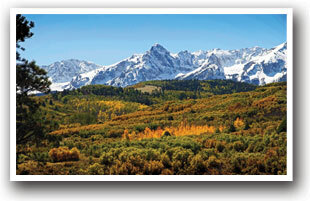 In the winter, Telluride and Purgatory provide elite downhill skiing. Winter also creates opportunity for snowshoeing, ice climbing, snowmobiling, and cross country skiing. Purgatory ski resort also provides summer activities; the ski lift will take you to the top of the mountain for sight seeing, wild flower viewing, and a toboggan-like alpine slide.